Posted in Pet Health on September 5, 2014. Last modified on February 01, 2018. Read disclaimer. Grocery store, pet store, or veterinary office dog food is fine for most sedentary household dogs, but working dogs have specialized nutritional needs. Law enforcement, sled, agility, hunting, racing, service, and even show dogs generally have higher nutritional requirements than those set by the American Association of Feed Control Officials (AAFCO), which requires that all feeds on the American market meet standardized nutrient requirements for dogs. In this post, we will look at some of these special needs which you can then discuss in more detail with your veterinarian, animal nutritionist, or professional trainer. WisconsinHealth.org is a participant in the Amazon Services LLC Associates Program, an affiliate advertising program designed to provide a means for sites to earn advertising fees by advertising and linking to amazon.com. Just as people who engage in little physical activity do not need as many calories as people who perform hard physical labor, household dogs may need fewer calories and other nutrients than working dogs. The more energy it expends, the more nutrients the dog requires. While commercial feeds are available specifically for working dogs, all working dogs are not the same. You will need to tailor your dog's diet to its workload. Many commercial diets for working animals are very high in calories and could lead to obesity for some pets. Recognizing that each dog is unique and has special needs is the first step to planning a healthy diet. Water is the most important nutrient in any dog diet, and dehydration can become a serious issue because dogs do not sweat to maintain body temperature. Instead, they cool their bodies by losing water through their tongues (panting) and the pads of their feet via evaporation. During intense exercise, your dog produces a large amount of heat, and respiratory water loss increases 10 to 20 times (Lewis et al., 1987). Always provide ready access to water, especially during long periods of exercise typical with working dogs; otherwise, dehydration may occur, causing unstable blood flow, decreased strength, and reduced work capacity. Daily energy requirements of dogs vary according to breed, level of training, exercise type, and weather. All intensely active dogs need diets rich in calories and nutrients. Energy required for movement corresponds more directly to distance traveled, rather than speed. Therefore, sled dogs that run over several kilometers require much more energy than racing dogs running for 500 meters. For example, a Siberian Husky working as a sled dog would need 1,400 to 1,800 calories per day for speed racing, 6,000 to 10,000 calories per day while running the Iditarod in Alaska, and 1,000 to 1,200 during periods of normal activity or maintenance. In contrast, the average man needs approximately 2,000 calories per day (Cline and Reynolds, 2005b; Kelly and Wills, 1996). Extreme heat and cold can also increase a working dog's need for extra calories. Working dogs require 1.5 to 2.5 times the energy needed by nonworking dogs, and this percentage can increase by an additional 50 percent if the animal is working in extremely cold or hot environments (Case, 1999). Fat is the most energy dense of all macronutrients (fat, carbohydrate, and protein), and it is a great source of energy for working dogs. Extremely active dogs should be fed a diet that is approximately 50 to 65 percent crude fat (CF) (Case et al., 2000), whereas a moderately active dog typically needs only 8-18% CF (Purina, 2005). Performance in dogs has been positively correlated with increased fat intake. Some breeds digest specific fats better than others; therefore, you should research breed-specific literature or talk with your veterinarian before supplementing complete diets (such as commercially packaged dog food) with fats (vegetable oils) (Kelly and Wills, 1996). 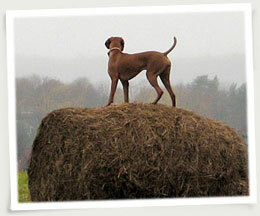 Carbohydrates are also important in a working dog's diet. Sprinting and racing dogs, such as greyhounds, typically do not require more total calories than most moderately active dogs, such as golden retrievers. They do, however, need energy quickly and in short bursts. Fat does not readily satisfy this requirement. Carbohydrates provide a quickly available source of energy from glycogen stores in the body. Glycogen is the stored form of carbohydrate found in the muscle, and only a limited amount is available in the body. Replace glycogen by feeding carbohydrates between races, or subsequent performances may be sacrificed. Sprinting dogs, such as greyhounds, need a diet that is 25-45% carbohydrate (Kelly and Wills, 1996; Lewis et al., 1987). Non-sprinting working dogs need a 10-15% carbohydrate-based diet (Case et al., 2000; Cheeke, 2005). Some carbohydrates are poorly digested by dogs and digestibility and absorption are critical to ensuring adequate nutrition. Therefore, again, it is important to research the diet ingredients before feeding. There is some debate over whether dogs use glycogen as successfully as humans, however, high carbohydrate and high fat diets are still thought to be the most efficient at providing energy for working dogs. All dogs need protein. Highly active dogs use protein's essential amino acids, such as valine, histidine, tryptophan, and methionine, for muscle condition, tissue repair, and hormone synthesis. The National Research Council recommends working dogs be fed a diet containing approximately 30-35% crude protein (CP) (Case et al., 2000). A moderately active dog only requires about 21-26% CP (Purina, 2005; Eukanuba, 2005). Be sure you select only foods that contain proteins easily digested by dogs. Many proteins found in non-animal based (grain-based) dog food are more difficult for a dog to digest; they provide more gastrointestinal (GI) fill and result in a less productive working animal. While the proper balance of nutrients is important to the health of your dog, palatability is perhaps even more important. If the food is not appealing, your dog will either not eat it or not eat it as readily. Information about the Affordable Health Care Act for Wisconsin. Comment at Research on the causes of aging from Jodie: "To say that people who are exposed to chronic stress may..."
Comment at Possible link between hygiene and childhood asthma from Jessica: "Very interesting. I wonder if probiotics, like in yogurt, would be..."
Comment at Special nutritional needs of active dogs from Freddie: "I found your site as I researching how a dog's diet..."
Comment at Is a raw meat diet good for dogs? from Lance: "The raw diet for dogs is a very interesting topic. Many..."
I found your site as I was researching how a dog's diet may effect it's ability to stay cool in summer. Since you're discussing protein levels, you may find this line interesting from http://www.vet.cornell.edu/news/Diet.cfm: "If you're a dog, digesting protein raises body temperature, so the longer your body temperature is up, the longer you keep panting." Thank you for sharing that, Freddie. You're right... that is an interesting and helpful observation.